Taxonomy Taxandria fragrans (Wheeler and Marchant, 2007) was first described botanically in 2001 under the species name of Agonis fragrans(Wheeler et al, 2001). 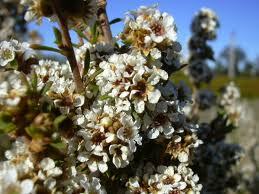 Prior to this it was known under the common names of Fragrant Agonis, Coarse Agonis and Coarse Tea Tree. Trademark FragoniaTM is the trademarked name used to define essential oil and hydrosol products produced from selected plantation-grown material of this species by the Paperbark Company of Harvey, Western Australia. Therapeutic uses There has been one published study into the antimicrobial and anti-inflammatory activities of Taxandria fragrans oil in vitro (Hammer et al, 2008). The researcher showed that Taxandria fragrans oil was comparable to Tea Tree (Melaleuca alternifolia) in its antimicrobial activity, when tested against a standard panel of test organisms (Hammer et al, 2008). In vitro immunological work has shown Taxandria fragrans oil to reduce the production of a range of pro-inflammatory cytokines TNFα, IL-6, IL-10, IFNγ and IL-13 by PHA-stimulated mononuclear cells. Aromatherapists and other remedial practitioners have since used FragoniaTM oil within clinical practise, shown it to be effective and proven its antimicrobial, anti-inflammatory and analgesic properties (Day and Day, 2008). While there has been some clinical evaluation of FragoniaTM carried out for physical conditions as mentioned above, aromatherapy practitioners have chosen to focus upon the psycho-emotional/spiritual aspects and uses of this oil. FragoniaTM has grown in popularity over the past 10 years and use by therapists around the world who have added this uniquely Australian oil to their therapeutic palettes. Anecdotal and clinical case studies are pointing the way to further scientific testing and research which needs to be done to allow FragoniaTM to be used in the wider community in pharmaceutical, cosmeceutical and personal care products. Read this article in its entirety in the Summer 2013 issue of the International Journal of Professional Holistic Aromatherapy (IJPHA-Vol. 2, Issue 1). Visit http://www.ijpha.com to subscribe. I found this quote at the top of the chapter “Vibrational Aromatherapy” in Valerie Ann Worwood’s book, The Fragrant Heavens. I understood immediately why she chose this quote to begin a discussion on vibrational aromatherapy, as I am often questioned about the science behind Color Energy Therapy and its esoteric nature. Two aspects of the body Science teaches us that the human body is in fact part physical matter and part energy matter. So, in order to have optimal health and wellness, we need to address both aspects. When we utilize Aromatherapy and Color Therapy together, we have the means to positively affect both aspects of the self. Color Aromatherapy is a form of vibrational Aromatherapy (a.k.a. energetic Aromatherapy) that not only addresses the physical body, but the energy component as well, providing an ideal holistic healing practice. Color therapy and aromatherapy are partners The innovative practice of combining Color Therapy and Aromatherapy offers a wise union of our most complex sense, our sense of sight, with our strongest sense, our sense of smell. There are rich similarities between these two senses and coordinating therapies: both communicate with the limbic system of the brain and the hypothalamus. Just as the olfactory bulb transmits fragrance molecules to the limbic system, photoreceptors in each eye transform light into electrical impulses which then affects the brain’s hypothalamus; both therapies trigger emotional responses due to this relationship with the hypothalamus which regulates the function of the autonomic nervous system. The experiences of pleasure, pain, “fight or flight,” and mental stress are governed by this system, thus our overall emotional health is affected. Both create biochemical reactions that send signals to the brain to stimulate the release of neurotransmitters including serotonin (olfaction) and melatonin (vision), both influence our sensory memory, and both stimulate vital glands. Aromatherapy affects the pituitary “master” gland which regulates hormones like endorphins. Color Therapy affects the pineal gland which secretes melatonin, influences intuition and is responsible for how the body utilizes light energy. Color Therapy is a form of light therapy, and many Color Therapists also utilize light to activate the pineal gland. Since both therapies trigger memories, there is the potential of forming new positive associations through color and scent. Color seems to affect memory partly due to the repetition of color associations in modern society known as “color conditioning.” For instance, the recurrence of seeing yellow smiley faces, the image of a smiley face inside a yellow sun, yellow legal pads, yellow highlighter pens and yellow Post-it® notes have clearly saturated our minds with the message that yellow is associated with joy and clarity. In his Introduction to Physiological Optics, James P.C. Southall speaks to our sense of sight and how the brain may be as much a part of determining what we see as our actual eyesight itself. “Adult vision is the result of an accumulation of observations and associations of ideas.” (Birren, 1950) It is the conscious utilization of this capability that makes Color Aromatherapy truly compelling. 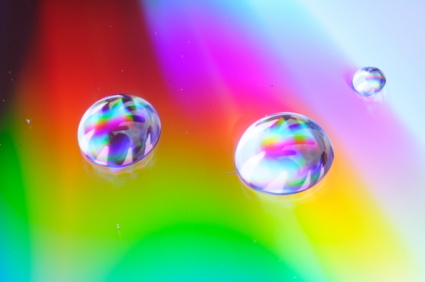 A deeper understanding of color therapy The value of Color Therapy dates back to 1500 B.C. It was keenly understood by the ancient yogic rishis who revered the Sun’s energy as a healer. A passage in the Atharva Veda, one of the oldest texts, speaks of jaundice being healed with the red energy of the Sun, and the Kurma Purana, an Ayurvedic treatise, speaks to all of creation being constructed of color rays from the sun. The Egyptian physicians utilized color in their healing practices evidenced in the Ebers Papyrus, an Egyptian medical manuscript, which mentions the use of “colored minerals that are endowed with efficacy apparently because of their hue” (Birren, 1950). Pythagoras, the Greek Philosopher who developed the Pythagorean Theory of Music and Color, related the wavelengths of the visible spectrum to both the frequencies of the notes in a musical scale and the planet’s own frequencies. He believed that the human body is a microcosm of the macrocosm and that the vibrations of color and sound affect the body (Carey and Muynck, 2002). Others who earnestly appreciated benefits of color include: Greek mystics Celsus and Galen who prescribed color to heal ailments, modern scientist Sir Isaac Newton who discovered the visible light spectrum, Johann Wolfgang Goethe who created the color wheel, as well as influential doctors Niels Finsen, Edwin Babbitt and Dinshah Ghadiali who developed Color Light Therapy techniques. What is Color? Simply put, Color is Energy. Color is vibration, frequency and particular wavelengths of sunlight’s visible spectrum. These color rays are always affecting you physically, physiologically, psychologically, emotionally and spiritually, whether you are aware of it or not. It is through experiments with Color Light Therapy that medical researchers have been proving the effects of color on the body and nervous system. For example, Dr. Sharon McDonald conducted tests at San Diego State University of Nursing proving that patients with rheumatoid arthritis had noticeable pain relief after putting their hands in a box illuminated by an incandescent light shining through a blue filter. In addition, clinical psychologist Alexander Schauss is now well-known for his revolutionary work with correctional centers spearheading the use of Baker-Miller pink (bubble-gum pink) painted walls, which proved to reduce muscle strength and aggression in inmates. Each color vibrates at a particular rate that has a specific effect on the human (hue-man) body and energy system. The slower-moving frequencies (red, orange and yellow) tend to stimulate the body and the faster-moving frequencies (turquoise, blue and violet) tend to soothe it. For example, Bright Red’s frequency is stimulating and has an energizing activating effect, whereas Pale Blue’s vibration is relaxing and will calm the body and emotions. Solid research has accrued on the psychological and physiological effects of the color rays red and blue, in particular, due to the attention of physicians interested in Color Therapy. In 1875, a European doctor named Ponza did studies on the effects of red and blue colored rooms on his patients, proving that red positively influenced introverted patients and blue calmed down agitated patients. In 1938, the Worchester State Hospital in Massachusetts did effective testing on patients with colored lights revealing that red and magenta had a stimulating effect, while blue had a soothing effect. In 1958, Robert Gerard, PhD. at the University of California-Los Angeles (UCLA) did substantial testing to prove that blood pressure increases under red light and decreases under blue light (Birren, 1950) . The full article can be viewed in the Summer 2013 issue of the International Journal of Professional Holistic Aromatherapy (IJPHA-Vol.2, Issue 1). To subscribe go to http://www.ijpha.com.